My New Book is In Stores Now! 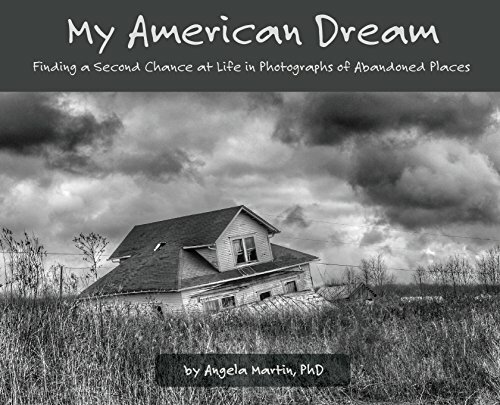 Angela Martin's debut book, My American Dream: Finding a Second Chance at Life in Photographs of Abandoned Places, is a unique photo essay and memoir written for art lovers and people seeking rare and valuable guidance on how to rebuild their lives after a personal tragedy. In the pages of this remarkable book, Angela shares a selection of her provocative photographs of abandoned places in the American mid-South. She also candidly relates her personal story of losing the American Dream in midlife, then finally, unexpectedly finding a second chance at life in the ruins of abandoned places. She shows us how connecting with the right creative work, on the right subject, at the right time, can touch your deepest self and shape who you are anew. Experiencing fine art, whether as a creator or an enthusiast, can transform body and soul, heal old wounds, and open one to fresh horizons filled with endless possibility. Angela's journey is a testament to the transformative power of creativity, and one filled with valuable lessons for anyone searching for a more meaningful life. My American Dream is both a commentary on the changing face of the American Dream over the last half-century and a call to a New Dream; one based not on the accumulation of wealth and things, but on learning to live a meaningful life as one’s most authentic self. Web address where the review will be published. Enter the shipping address for your review copy (PLEASE NO P.O. BOXES). Please let me know your plan and timeline for reviewing the book. Thank you! I will evaluate your request and get back to you as soon as possible. If so, please click the button at right and fill out the form to request a FREE advanced review copy of My American Dream. Angela Martin, PhD is a southern fine art photographer, nonfiction author, blogger, and anthropologist. Although born and raised in Kentucky, she has lived her adult life in five different states and in three different countries. Angela has only recently returned to the American mid-South to build her next (new) American Dream. She currently resides near Nashville, Tennessee. Angela's work is reflective of her background in cultural anthropology and her enduring interest in belief, culture, and the role of images in the construction of meaning and sense of place. Her photographs have been exhibited in multiple galleries in the United States. When not roaming the backroads creating images of landscapes, nature and places, she writes about the experience of fine art photographs at the Light Brew Blog. Find out more about Angela here. My American Dream is also available for pre-order at Amazon, Barnes & Noble, Indiebound.org, and your local bookstore. Order your copy today (ISBN 978-0-692-10936-6).